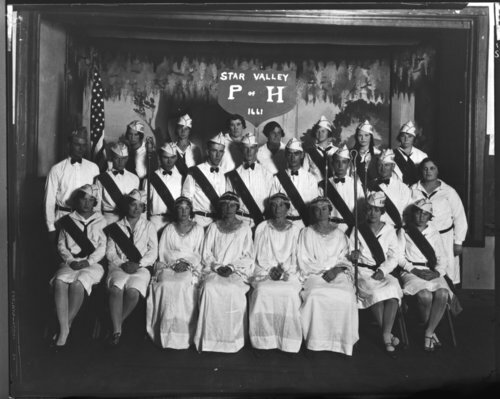 This photograph shows the Star Valley Grange group, Patrons of Husbandry, lodge number 1661. Both men and women are pictured in somewhat elaborate uniforms. The National Grange of the Order of Patrons of Husbandry, also simply styled the Grange, is a fraternal organization for American farmers that encourages farm families to band together for their common economic and political well-being. It was founded in 1867 and reached its peak in the 1890s through the 1950s. In addition to serving as a center for many farming communities, the Grange was an effective advocacy group for farmers and their agendas, including fighting railroad monopolies and advocating rural mail deliveries.